Index Funds - More Evidence Why You Should Use ThemEliminate The Muda! Like so many others, I have tried investing in the stock market. Jim Cramer is one of my favorite entertainers. Becky, Carl and Joe wake me up every morning. I have read every book that you see in the list of recommendations to the right and more. Sadly however, I too have lost a crap load of money in the market over the past two years. Have I learned my lesson yet? Not completely. I will continue to play with a small portion of my investments in individual stocks. This portion I refer to as my “fun” money. I play with small caps and jump on the “sure bets” which more often than not have not been so “sure” in the past year. While it’s not rational, I admit, to play the market, I have placed the majority of my overall investment in low cost index funds. Why the shift? One of the books listed in particular was instrumental in changing my investing habits significantly and I believe for the better. 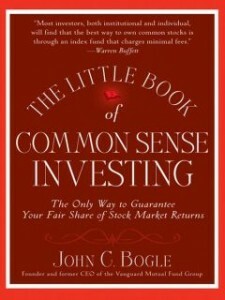 The Little Book of Common Sense Investing by John C. Bogle provides an intelligent perspective on the mysteries of the market. Bogle is the founder and creator of the world’s first index fund. He shows how the market if fundamentally a zero-sum game, meaning for every winner, someone must lose. There are countless studies that have shown in most cases the professional “actively” managed mutual funds fail to produce results that exceed the market averages. Bogle’s point, why fight it. If even the professionals can’t beat the average, then are we not better off by being just average? Being just average means you will beat 80%+ of the professionals! Here is even further proof. There is an independent market research firm called Dalbar Inc. Each year they publish a study called The Quantitative Analysis of Investor Behavior (QAIB). This study measure the actual performance of investors as compared to various benchmarks. They found over the last 20 years ending in 2008 the average stock investor earned a paltry 1.87%. In that same time period the S&P 500 had an 7.55% return when adjusted for inflation! Hmmmm. Take the road of the passive investor, invest less time effort and energy in the process, enjoy lower fees and expenses and enjoy greater returns. That sounds like a great way to eliminate muda from your life. Maybe it’s time to reconsider my “fun” money. What Is P/E Ratio? « Eliminate The Muda!